The Republic of Côte d'Ivoire (which means "ivory coast" in French), on the south coast of the western bulge of Africa, has an area of 322,460 square kilometers (124,502 square miles). Comparatively, the area occupied by Côte d'Ivoire is slightly larger than the state of New Mexico. 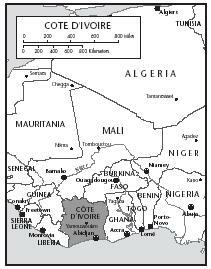 The greater part of Côte d'Ivoire is a vast plateau, tilted gently toward the Atlantic, although the Guinea Highlands (in the northwest, from Man to Odienné) have peaks higher than 1,000 meters (3,280 feet). The greatest annual rainfall, 198 centimeters (78 inches), is along the coast and in the southwest. The coastal region has a long dry season from December to mid-May, followed by heavy rains from mid-May to mid-July, a short dry season from mid-July to October, and lighter rains in October and November. Farther north, there is only one wet and one dry season, with rainfall heaviest in summer. Thousands of years prior to the arrival of the Europeans in the 1460s, independent tribes occupied present-day Côte d'Ivoire. They survived mostly on gathered seeds and fruits and hunted animals. Foods and eating habits were most likely influenced by outsiders who used the land as trade routes from as early as the 700s. Little, however, is known about the early inhabitants. Europeans desperately sought the country's supply of ivory (from the tusks of elephants) and gold, so trading and exploitation of these goods continued. 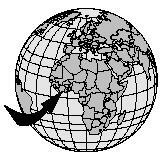 The country's nickname, the Ivory Coast, originated because of the country's well-known supply of ivory. In return for the gold and ivory, the Portuguese brought European weapons and cassava, now a daily staple, to the Ivoirians. By the mid-1800s, French merchants discovered the large amounts ivory and gold that originated from Côte d'Ivoire. In exchange for money and the promise of French protection, France was given permission to take control of the country's coastal trade routes. With the hopes of planting profitable cash crops (crops grown to make money), the French began planting coffee, cocoa, and palm oil (an essential ingredient for preparing African food) along the coast. Eventually one-third of the cocoa, coffee, and banana plantations belonged to the French. Côte d'Ivoire's roughly 60 ethnic groups bring diversity to the country's cuisine. Each group has developed a diet that is suitable to their lifestyle. The Agni and Abron groups survive by farming cocoa and coffee. The Senufo peoples live in the country's northern savanna (treeless plain). They cultivate rice, yams, peanuts, and millet (a type of grain). Rice with a peppery peanut sauce is often enjoyed by the Senufo people. The Dioula of the far northwest depend on their cultivation of rice, millet, and peanuts to survive, while the Kulango people of the north, who are mostly farmers, grow yams, corn, peanuts, and watermelons. Those living near the coast enjoy a wide variety of seafood. Despite varying diets and food customs, the people of Côte d'Ivoire generally rely on grains and tubers (root vegetables) to sustain their diet. Yams, plantains (similar to bananas), rice, millet, corn, and peanuts (known as groundnuts in Africa) are staple foods throughout the country. At least one of these is typically an ingredient in most dishes. The national dish is fufu (FOO-fue), plantains, cassava, or yams pounded into a sticky dough and served with a seasoned meat (often chicken) and vegetable sauce called kedjenou (KED-gen-ooh). As with most meals, it is typically eaten with the hands, rather than utensils. Kedjenou is most often prepared from peanuts, eggplant, okra, or tomatoes. Attiéké (AT-tee-eck-ee) is a popular side dish. Similar to the tiny pasta grains of couscous, it is a porridge made from grated cassava. For those who can afford meat, chicken and fish are favorites among Ivoirians. Most of the population, however, enjoys an abundance of vegetables and grains accompanied by various sauces. Several spicy dishes, particularly soups and stews, have hot peppers to enrich their flavors. Fresh fruits are the typical dessert, often accompanied by bangui (BAN-kee), a local white palm wine or ginger beer. Children are fond of soft drinks such as Youki Soda, a slightly sweeter version of tonic water. Often the best place to sample the country's local cuisine is at an outdoor market, a street vendor, or a maquis , a restaurant unique to Côte d'Ivoire. These reasonably priced outdoor restaurants are scattered throughout the country and are growing in popularity. To be considered a maquis , the restaurant must sell braised food (food that has been cooked over a low fire). The popular meats of chicken and fish are the most commonly braised food and are usually served with onions and tomatoes. Rice, fufu, attiéké , and kedjenou are also sold. Cassava has a glossy, brittle skin, and is typically 6 to 8 inches long. Melon Fingers make a delicious and refreshing dessert. Cut the melon into eighths, or sections, about 1-inch wide and remove the seeds. Next make cuts cross-wise about ¾-inch wide across each melon slice. Arrange the slices on a large serving plate. Section the lime and place a slice of lime in the center of each melon slice. 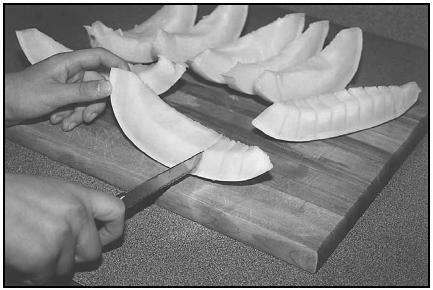 To make melon fingers, slice a honeydew melon, remove the seeds, and make cuts across each melon slice. Place the chicken, onion, tomatoes, ginger, garlic and bay leaf in a heavy casserole dish. Cover with a thick, tight-fitting lid that will not let any steam escape. Remove the casserole from the heat and without removing the lid, shake the casserole well to stir up the contents so that it cooks evenly. Place the contents of the casserole on a warm platter and serve with rice. Most (65 percent) of Côte d'Ivoire's population follows traditional African religions. They honor their ancestors and believe in the spirits of nature. Even the other two major religions of the country, Christianity (12 percent) and Islam (23 percent), often combine traditional practices with their faith. Some traditional religions recognize sorcery and witchcraft, particularly those living in rural areas. Probably the most anticipated time of the year for Muslims (believers of Islam) is Ramadan, a monthlong observance in which food and drink are not consumed between sunrise and sunset. Eid al-Fitr , the feast that ends this fasting month, lasts two to ten days. The feast may include a variety of seasoned meats with sauce, rice, yam or eggplant, salads, and soups or stews. Eid al-Adha (the feast of the sacrifice) starts on the tenth day of the last month of the Islamic calendar. After prayers, the head of each household typically sacrifices (kills) a sheep, camel, or an ox. It is often eaten that evening for dinner and is shared with those who could not afford to purchase an animal to sacrifice. Christians, both Protestant and Roman Catholic, observe such holidays as Good Friday, Easter, and Christmas. Similar to the custom of Muslims on their special days, Christians gather with family and friends on Christian holidays to enjoy a meal together. Cities are often decorated with bright lights and decorations, and people gather in the streets to sell fruits and other items. Réveillon , the Christmas Eve dinner served after midnight mass, is often considered the most important meal of the year. A Yule log is traditionally eaten as a special dessert. The people of Côte d'Ivoire also celebrate secular (nonreligious) holidays such as National Day (December 7), commemorating the country's independence, and New Year's Day (January 1). At the beginning of harvest time, yam festivals take place to honor the spirits who they believe protect their crops each year. To celebrate, the Kulango people exchange gifts and eat a meal of mashed yams and soup and participate in dances and song. Some villagers celebrate the harvest of other important crops, including rice. Mash the soft yam pieces in a mixing bowl. Gradually add the beaten egg, butter, and salt, mixing well to make sure that all ingredients are blended. Spoon the mashed yam into an oven-proof casserole dish and spread the top with the beaten egg yolk. Place it in the oven for 15 minutes, or until golden brown. Sprinkle the top with nutmeg and cinnamon. Fry the meat and onion until the meat is browned. Add all the remaining ingredients and enough water to partially cover them. Cover, reduce heat, and simmer on a very low heat for 2 or more hours. Some of the country's most tasty food can be found in people's homes. The Ivoirians are generous, hospitable people who enjoy inviting others to join them for a meal. Ivoirians believe that those who are blessed enough to be able to prepare a meal should share their good fortune with others. In a typical village, villagers eat together in a common area. They believe eating not only gives the body nourishment, but also unites people with community spirit. Women and girls eat as one group, men as another, and young boys as a third group. Most villagers eat on a large mat placed on the ground. With their right hand (the left is considered dirty), villagers will scoop up their food from large bowls placed in the center of the mat for everyone to share. Most often rice is rolled into a tight ball and is used to scoop up meat and sauce. The eldest villagers eat first. They do this in order to detect any contaminated or sour food. If bad food is suspected, the elder members will stop the younger members, including children, from eating from the bowl. Once everyone has begun eating, there are some rules that are followed. It is considered rude and selfish to reach across the table for food. Villagers want to make certain that everyone receives similar amounts of food. Coughing, sneezing, and talking during the meal is discouraged. If a person needs to cough or sneeze, it is customary to get up and walk away from the mat before doing so. After the meal is over, a bowl of water is passed around to cleanse the hands. Talking amongst the villagers will typically resume as the diners relax to digest their meal. Place the peanut butter in a pot and add 4 Tablespoons water. Mix well until it is sauce-like and add 1 cup water. Bring the sauce to a boil and add 2 more cups of water over a 25-minute period. Take 12 cherry tomatoes, remove the seeds, and mash. Add the tomato mash and another 4 cups of water to the sauce and continue to boil. After 50 minutes of boiling, add 2½ more cups of water, then let it boil again gently for 20 minutes. Add precooked meat of choice and a pinch of salt and keep boiling for an addition 35 minutes. Add the remaining cherry tomatoes, prepared as before, the oil, and the mashed onion. Peel the avocados and cut out the pit. Cut the avocados into cubes. Grind the peanuts roughly with a rolling pin or in a grinder for a few seconds. Mix the peanuts and spices well and sprinkle over avocados. About 15 percent of the population of Côte d'Ivoire is classified as undernourished by the World Bank. This means they do not receive adequate nutrition in their diet. Of children under the age of five, about onequarter are both underweight and stunted (short for their age). 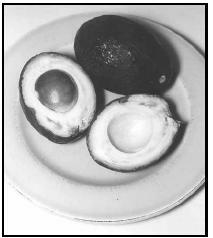 The ripe avocados for Avocado with Groundnut Dressing have pebbly black skin and creamy, soft flesh. The large pit in the center is easily removed. De Leschery, Karen, "More Fonio, Less Hard Work." Aramco World . January/February 1997: 38-39. Sheehan, Patricia. Côte d'Ivoire: Cultures of the World. Tarrytown, N.Y.: Marshall Cavendish Corporation, 2000. Webster, Cassandra Hughes. Mother Africa's Table: A Chronicle of Celebration through West African & African American Recipes and Cultural Traditions . New York: Doubleday, 1998. West Africa . 4 th ed. Victoria, Australia: Lonely Planet Publications Pty. Ltd., 1999. Ivoirian Cookbook. [Online] Available http://www.execulink.com/~bruinewo/recipies.htm (accessed April 23, 2001). Ivory Coast Recipes. [Online] Available http://belgourmet.com/ (accessed April 23, 2001). The Congo Cookbook. [Online] Available http://www.geocities.com/NapaValley/Vineyard/9119/c0088.html (accessed April 23, 2001). World Travel Guide. [Online] Available http://www.wtgonline.com/data/civ/civ070.asp (accessed April 23, 2001).